Any machinery is bound to experience problems at one point of time or another. This is either due to some technical issues or the usual wear-and-tear. As you might already know, this concept applies to air conditioners too. Aircon units are prone to breakage over time and with this, they’ll also require repairs. 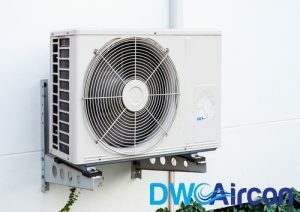 When it comes to carrying out an aircon repair, not only should one be aware of the range of aircon repair symptoms, but also the types of aircon repair available. one should first be aware of the common repair types done to an air conditioner. Air conditioning units will tend to experience leakages from either the indoor unit or the outdoor condenser unit. With this, it is deemed a common aircon repair issue especially when a unit does not undergo regular aircon servicing. However, the key issue here is not the leak itself, but rather how to spot the leak. This cannot be done by everyone. Only a qualified AC repair contractor can spot the leak and at the same time know how to resolve it. If the leak is persistent, then there are chances where it might decrease the level of the refrigerant in the system and create further issues and lead to more expensive AC condenser repair cost. The basic task of a compressor is to maintain pressure in the refrigerant so that it is able to release heat. To keep things in place, a compressor has its own motor and a set of wirings. Since this system will run every time you turn your aircon unit, it is likely to experience electrical and motor problems. As this compressor problem requires complicated troubleshooting and repair work, engage in the services of an experienced aircon technician to solve the issue. An aircon unit has two fans, namely, the blower and the condenser fan. While the condenser is responsible for taking out the heat, the blower pushes the cool air into the ductwork. Like other aircon parts, the fan motor, blades, as well as the belts run into some problems after constant usage. 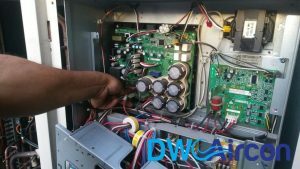 There are several reasons as to how an air conditioning unit’s circuit board (PCB) can get damaged. There might be a sudden increase in electric voltage, a shorted wiring, or a short circuit might occur due to the presence of pests and insects. It is highly recommended to get your PCB checked during aircon servicing. Otherwise, opt for a certified aircon technician to repair it. When capacitors require repairing or replacement, it might be because of an overheating problem. This issue can blow up fuses, which leads to operating problems like sudden shutdowns and humming sounds emerging from capacitors. Is your aircon not blowing cold air? If your air filter and fan motor seem to be in good working condition, then you might have a problem with your thermistor. Immediately get this issue fixed as soon as possible as a broken thermistor will not be able to prompt the PCB to turn on the compressor. When running into aircon repair issues mentioned above, the best thing to do is to call an experienced and reliable air condition servicing company providing reasonable aircon conditioner repair prices. 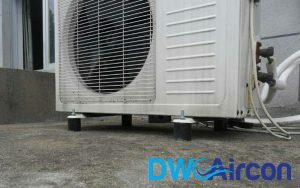 At DW Aircon Servicing Singapore, we offer profession aircon repair Singapore services at affordable pricing. 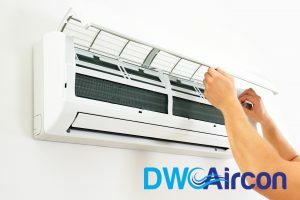 Our team of aircon technician have more than 10 years of experience and are well-equipped with the necessary skills and knowledge to solve any of your aircon problems. Browse our wide range of aircon projects and positive reviews to see it for yourself!